Fluffetts Free Range are proud to produce eggs the traditional way. Fans of their fresh tasty eggs include chefs, Angela Hartnett MBE and James Golding. Meet Ben, owner of Fluffetts. Ben can remember a time when there were only 40 or so hens on his family farm. They were kept just to produce enough eggs for his family and a few close friends and neighbours. It wasn't until the late nineties that they made the massive increase to 16,000 hens in a franchise scheme launched to supply supermarkets. "My mum had nicknames for everything. My sister was fondly named 'Ramps' because of all the speed bumps on the way to her school, soon the hens were christened the 'Fluffetts' and that was to stick as our business name," recalls Ben. The increase in hens came at a similar time to Ben flying the nest. "I knew I would always end up back on the farm but I had other adventures I wanted to experience first," Ben recalls. "I spent fifteen years in Notting Hill where I opened a kite surf shop. It was here that I learnt on-the-job about retail." And Ben was right, he did return to Hampshire and the hens. He leads up Fluffetts which has now moved on from the limitations of the franchise arrangement. As the key supplier of eggs to over 350 Hampshire schools, Fluffetts is a busy operation. "There are nine of us in the team and there is very much an all-hands-on-deck approach. We all stop what we are doing to help at the key crunch points in the week from the egg packing to the deliveries," Ben explains. Fluffetts Free Range Eggs all display the number 1 on their shells, this shows that they are indeed free range - something Ben is extremely passionate about: "A bird with a higher level of welfare doesn't release stress hormones and as a result the quality of its eggs will be better. 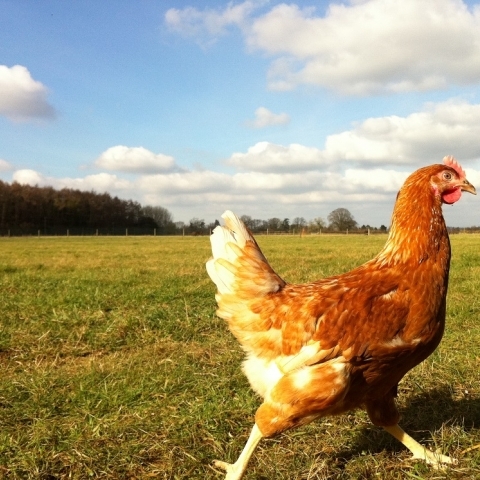 I open the hen houses every day and out they run, revelling in their freedom. Caged and barn hens miss out on this existence. Our birds can forage for insects, clover and roots giving them a more varied diet." A tip to tell just how fresh your eggs are. "Eggs have a best before of 28 days from laying. Our short supply chain means that our eggs are often in the shop just a few days after being laid and therefore have long shelf life. An old hand from the poultry industry once told me the best time to eat an egg is 5 days after it has been laid. If you're looking at eggs with just a week or so left then they can't be fresh," explains Ben. Ben's latest venture brings the opportunity to use his retail skills and experience once more. They have opened 'HOME' in Wimborne, their first retail outlet specialising in Honey, Oil, Milk and Eggs all sourced locally. Ben has been excited to see his idea become a reality: "I have been really heartened by the network effect within the local food community. One connection opens doors to another connection, we have managed to bring together a really enticing selection of local produce. I believe Hampshire is a benchmark when it comes to local food. Collaboration is strong here." And do Ben and his family indulge on Pancake Day? "Of course," Ben enthuses, "we'll be having lemon and local honey. I've also recently picked up a fantastic jar of raspberry jam made by Charlotte Brown, I have a feeling this will be featuring too!" Based within The New Forest, Fluffetts Farm are producers and distributors of the finest quality and freshest free-range eggs.